"Immortal Essence: The Life and Writings of Danske Dandridge, Poet and Nature-Lover"
"Immortal Essence by Danske Dandridge"
"What is astir where the shadows are dense? "Is it a word that I never have heard? God is walking and talking again 'mid the trees. "The day is closing. It has been a golden day; full of rest. Now I must go and tend my flowers. "Sometimes when confined to the house by illness, or on stormy winter days, I have felt as restless as a caged wild animal; but out-of-doors, I am in my proper place, like the free wild animal in the jungle. "I am so glad that we have had a heavy rain, because I was beginning to feel quite wicked about it. It began when I woke up early this morning. The sound of the patter of the big drops on the tin roof of the verandah outside my window was such an unusual one that I could scarcely believe my ears. It seemed too good to be true. Soon it became a steady down-pour that has washed away all my discontent. It rained until one o'clock, softly but sufficiently. One such rain as that a week would keep the garden fresh all summer. "I am glad that I can dig and plant and weed, as much as I please, and shock nobody, not even the gardener, for I am the gardener, myself, and not easily shocked at that. And I am sure I enjoy my flowers all the more because I have prepared cradles for them, and assisted at their birth, and helped them at every stage from tiny seedlings to lovely, blossoming maturity. "One sumptuous Oriental Poppy, fully eight inches across, has just unpacked her thin silk dress of flowing vermilion. It is the one note of brilliant color, the high light that the picture needed. This blossom, erect on a stalk four feet in height, has six petals, while the others have but four. "The Poppy is a very careless packer. Her fine dress came out of its trunk in many crumples, which take her maid, the breeze, several hours to smoothe. But she does not care, beautiful, disorderly creature that she is. Oh blessed people who see their gods spring up in their gardens!!" "If any flower were worthy of worship it would be the Madonna Lily, also called the Annunciation Lily, first brought to earth, according to the legend, by the angel who came to prepare Mary for the Saviour's birth. This Lily is the type of passional purity, not passionless purity, which is a poor tame thing. The warm throbbing purity of the innocent young girl is a different thing , and a better thing, according to my way of thinking, than the cold chastity of the nun. This is what the Lily typifies, this passional purity, with its rich fragrance and unspotted whiteness. "The Cinnamon Rose is always the first to bloom at Rosebrake. A pretty little Scotch Brier is the second. . .And the Hollyhocks have proved that they too, have heroic souls; only all the best clumps have been eaten by the cows who have developed an extraordinary appetite for Hollyhocks. "I wish I could tell my flowers how much they help and comfort me and yet, who knows? Perhaps they understand? They look as if they did. Yes, yes there is certainly an understanding between us. I love to water them most when they are in distress. Do they not breathe lovely confidences into my ears every day? And do I not open my heart as freely to them? No one who has a garden of flowers to love and be loved by, need complain about being misunderstood. "When I go to the garden with my troubles the flowers know just what to do. They don't say a word, they don't torment me with senseless conversation. They just look at me, and their beauty makes me forget my cares, and their smiles restore me to cheerfulness, and their fragrance refreshes me, and strengthens me to bear what I must. And so I go away serene again and thanking God for my garden. Surely ugliness is the only sin of which flowers are capable, and that is usually man's fault, who will not leave Nature alone. "If I could carry out all my fancies I would have garden parties when certain flowers were in bloom. In May, I would have a Violet fete, a fete of Roses in June; and of Lilies in July, and perhaps a fete of Yuccas on some moonlit evening. In November, I would invite all my friends to a Chrysanthemum party. The tables should be set on the lawn, and decorated with the flowers of the day. "Last night was a beautiful one. 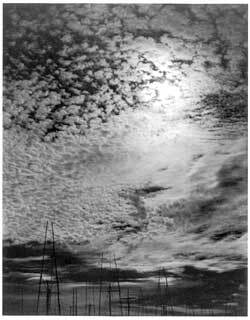 The moon was in her second quarter, and the sky was mottled with fleecy cloudlets. We counted thirty-eight buds on the evening primrose, ready to unfold. All the family, some house guests and a caller were there to enjoy the pretty spectacle. "About half-past seven the show begins, and we take chairs in the orchestra circle, to watch the performance. "One after another, then two or three at a time, the buds neatly rolled in their long green calyxes, began to stir, to swell to burst slowly open. The calyxes fell back with a graceful movement. There was no hurry, and no delay. The whole plant was in tremulous motion, although there was no breeze. At last she stood arrayed in the full glory of her blossom-hood, and a delightful penetrating odor diffused from every delicate flower. The flowers are pale lemon yellow. "This is only one of the many pleasures for which we have to thank out garden; pure, elevating, refined. Every night for a long time to come there will be more blossoms, for there seem to be hundreds of buds. "I can see great streams of people going up the state road in front of Rosebrake to the Agricultural Fair a half mile away. A great crowd is not an enlivening spectacle especially when it is a crowd of hard-working, stolid, farmer-folk, honest, worthy, farmers and their wives. Every one is hot and tired, and begrimed with dust. Women carry lunch baskets, and heavy babies. 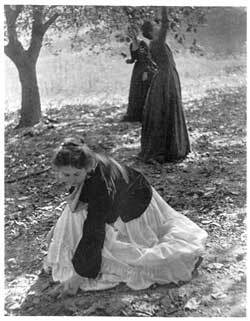 The young girls drag their best white skirts in the dust. "It is a very quiet crowd. All look as if they were seeking something that they cannot find. The middle-aged women wear large, black, straw hats, and black cotton dresses hang limply around their shapeless figures. I sat a long time watching them. Some little boys and girls and some of the Negroes were the only ones who looked gay. "The farmers all have a patient, dogged air, like their own cattle. They work so hard. They have so little. Yet they seem happy enough in their own homes. "The crowd was overawed by the crowd. I think that was it. The expression of a city crowd is much brighter, gayer, and more reckless. Used to contact with strangers, such contact no longer depresses, but exhilarates. Men and women, like precious metals, are brightened by friction. But country people are like metals in the rough. "After watching the crowd a long time without seeing one mature face that expressed hope or happiness, I felt overpowered with a sense of the nothingness of all things. 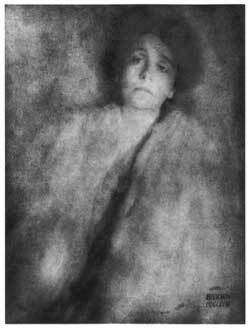 I could no longer see the sunken, sun-burnt cheeks of the men, their mouths stained with tobacco, their coarse store clothes, the ample figures of the elderly women with their stolid, care-lined faces, or the fresh thoughtless countenances of the young men and women, except through a mist of pity and hopelessness. Pity is good, but hopelessness is useless. So I came away. "O strong oaks, O blue mountains, O winds of heaven, O infinite mysterious sky, how holy, and how healing, and how hopeful, you are, after that!! Dear men and women! The universe belongs to you. Look up, and be helped and comforted. The still, small voice of God might speak to us?" "Anon we're laughing down the vale. "Although its residents abuse Shepherdstown very much, and are frequently heard to wish passionately that they lived anywhere else, yet it exercises a curious fascination over all who have once found it out come back to it again and again. 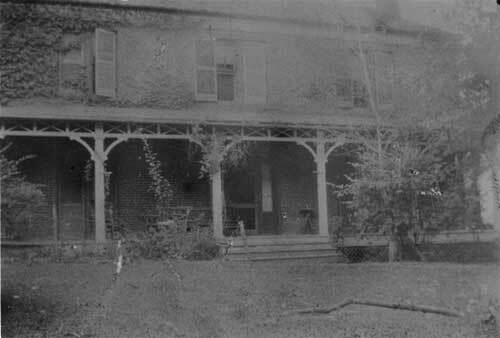 "This custom of Shepherdstown does not tend to promote hilarity in its inhabitants. "Tell me somsin else to do for you Aunt Tatie, I'm twyin' to be a little Twistian child. I know I'd like it." "Ah Stevie, Stevie! You have long been a heavenly child. Do you like it, dear, do you like it? "I spend many lonely hours, and if it were not for the baby, and the kittens, and the garden, I don't know what would become of me. With these blessings, and a few books, the world may be forgotten." "Ah me! what battles I have fought! "Come often, thou eternal child! "New-string thy lyre and sing to me. Of God's beneficence to man?" 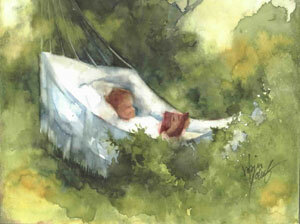 "When I go out to the hammock in the leisurely afternoon, I debate within myself what spirit shall be my companion. Books are mediums, and by them we live in communion with the spirits of the absent or the departed. "For the garden I want very choice company. Jeffries, Thoreau, Burroughs, and among poets, Chaucer, Spencer, Wordsworth are favored guests. My test for a book in the summer is - Will it do to read under the trees? Almost all good poetry is adapted to out-of-door reading. All that rings false or hollow, all novels of fashionable life, or ignoble ambition are as out of place in the grave and reverend company of trees as a painted and bedizened woman of the world would be. "History cannot peacefully be read in the hammock because it is too harrowing. The grove is no fit arena for marchings and counter-marchings, massacres, and bloody victories. "I choose my companions very carefully for this, my hour or two or peace, after the work of the day is over. I do not want any book that would jar the quiet harmony of sky and cloud, and tree-tops, or disturb the brooding calm of the hills. "Pure, not too strenuous love stories gain a fresh charm read in this manner, and so do fairy stories and romances, for which I still have a weakness. I think I will have to complete my shelf with children's books, such as Hans Christian Anderson, and Hawthorne's Wonder Book, and Mrs. Ewing's stories, at least the most cheerful of them. After all, we have to go to the children's bookcases for cheerfulness nowadays. "It has not yet become the fashion to write pessimistic literature for them, thank heaven! When children's books become morbid, I will no longer have any hope for the human race. 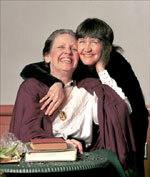 "Lillian Whiting says that it is everyone's duty to be happy. 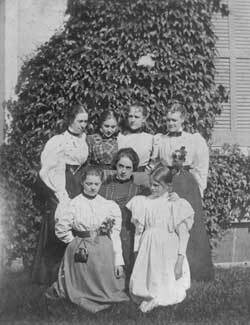 The young ladies scour the country in search of Amusement going ten miles to a dance, and coming home to lie in bed all the morning. I stay quietly in my hammock, and not Amusement; but better far, her sister, Enjoyment, comes to me unsolicited. She floats on the swan-white clouds; glows in the sunsets rises in the pages of books. She closes my eyes at night, wakes me up with me in the morning, and her other name is Content." "Being alone I am quite happy today. I am generally happy when I am out of doors, with nothing at all to worry me, and when the birds sing, and the air is sweet. It's so beautiful here today that I can do nothing but take deep breaths of joy. The many birds that are as happy as I am do not seem to find me in their way. They are so used to my presence that they go on with their daily avocations as if I were quite in the family. "The cat-bird comes to give me all the gossip of the garden. I love the Carolina wren. He is such a dear little dunce. He has a stock repertoire of at least a dozen songs or sayings, all equally artless, not to say idiotic, and he seems equally pleased with them all. He reminds of a man who will be singing snatches of songs all day long, although he has no ear for music and is never in tune. They have built themselves a nest inside the shutters of my sitting room window and do not care whether they are twin souls or not. Twin souls, the philosophers say, seldom find each other, but in some happier star. Is it not a pity that we are such complex beings? "Almost all the country homes in this County and quite all the towns are spoiled to sensitive ears by the sharp, quite incessant chirp of the English sparrow, that wretched little intruder that makes me think of Poe's lines: "They are neither man nor woman; They are neither brute nor human; They are ghouls." "If they are not ghouls, they are imps, not worthy of the name of birds. They only typify the worst rabble element of a great people. They think they own the earth; and they want all the best places in it; and they rob and quarrel, and fight, and are, cruel, and I don't know anything good about them at all. "Every spring we open a campaign against them, and give no quarter as long as a male remains on the place. We shoot them, and we broil them, and eat them on hot buttered toast. They are fat and juicy with rapine and plunder of our gardens. In eating them, I have learned to understand the pleasure that cannibals take in devouring their enemies. "A blind man could tell the time of year in this garden from earliest April until the last fragrant flowers are killed by frost. First comes the Almond blossom, late in March or early in April, followed quickly by the blossoming Plums … Sweet odors have a great charm for me, and I am a sort of epicure of perfumes. I make pot-pourri with which I fill jars, and set them in every room. I stuff pillows with prepared rose-leaves, and also with aromatic Pine needles. I buy essential oils and experiment with them, and make my own toilet waters. "The other day I gathered a bouquet of fragrant flowers. These were Lavender, Lemon-Thyme, Melissa Balm, the aromatic Caryopteris, Lemon-Scented Verbena, Petunias, Mignonette, a belated Rose or two Sweet Alyssum, and some Saponaria, which is a weed in the Wild Garden. To this was added a few sprays of Sweet-Brier, and leaves of Rose, Lemon, and Nutmeg Geranium. It was a rare medley of odors. "Just now there is such a blending of rich colors in the garden that the blind man might be puzzled to distinguish between them. That spicy whiff is from the group of hybrid Sweetbriers. Under my window the Mock Oranges are almost overpoweringly sweet . . . If I stray beneath the Paulownia tree, the blare of its purple trumpets overcomes me, and I must beat a hasty retreat. This is perhaps an idiosyncrasy, as I never heard of anyone else who was made faint by its heavy unwholesome exhalations. "I wish that a Society for the Suppression of Nuisances could be formed in every country neighborhood and that it would take stringent measures to supress the Unwelcome Guest. In this part of the world the doer of one's house is supposed to be always wide open to all comers. 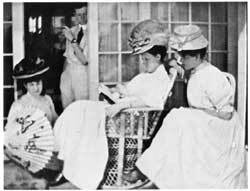 We have to keep up the traditions of our ancestors before the war and because the southern planters were flooded with visitors all summer, we, too, in spite of changed conditions of things, must observe the sacred laws of hospitality, however inconvenient they may be. In the North they are wiser than we, and do these things better. You are invited for a certain number of days and you don't overstay your time. You don't go unless you are asked, and, presumably, you are not asked unless you are wanted. "It is far otherwise with us. If a relation, no matter how distant, or a friend of a relation; or a friend of a friend; or a friend of a friend's relation, comes within fifty miles of you, you are bound to invite him or her - it almost always her - to your house for an indefinite stay. The cook may be ill or non-existent; the children may all have the measles, you may be half-dead yourself, but no matter. Nothing matters, except that the laws of hospitality be not infringed. "When your guest after driving you to the verge or over the verge of nervous prostration, finally wearies of you, and proposes to depart in search of new victims, you must set your teeth and urge her to stay as if your future salvation depended upon it. "When you have guests you must not leave them to their own devices an hour. You cannot go and shut yourself into your room for a quiet morning's work; you cannot laze in the hammock through a long afternoon; you must exert yourself to be entertaining every minute of the day and half the night, except when you are preparing delicacies in the kitchen over a steaming stove. It is always the hottest weather that the Unwelcome Guest makes her appearance. "It is so easy for husbands to be hospitable!! When time is up, he insists upon a longer stay and that so urgently that he will not take no for an answer. He does not have to keep house, nor instruct the cook in the art of dessert-making when the kitchen thermometer marks 98 degrees. He is only conscious of an agreeable listener to the stories his wife got tired of so many years ago. And he enjoys eating the desserts. "The Unexpected Guest is almost always the Unwelcome Guest. "The wish to escape from the untimely visitor has often inspired me with the desire to live in a tree. Everyone should have some safe refuge from the cares and trials of housekeeping. If I could manage it, I would have a secret stair built in the heart of our giant Oaks, which should lead to an eyrie at the summit, hidden from all eyes. Into this peaceful nest I would disappear upon occasion; say just as undesirable carriage wheels were heard approaching the house. From my airy perch I would calmly survey the coming and going of the curious, myself unseen, unheard. How cool, how care-free, how bird-like! I would be, in my safe seclusion! I am afraid I should burst into song for very glee and thus betray my secret." "What did I see in the woods, to-day? I saw a fairies' gypsy-camp. "That wild-eyed gypsy, brown and red! "For that would break the charm, she said. "I saw a fairies" gypsy-camp. 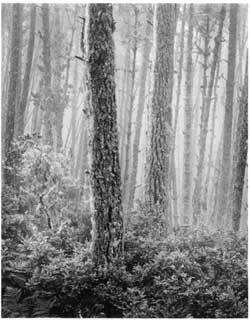 "Among the bracken, soiled and damp. "Last night, I lay alone in the darkening garden. It was very still except for the shrilling of the crickets and cicadas and the beat of hoofs and rolling of wheels on the high roads, that came up to me, softened by distance. "The head of the house was away; the servants had gone to their cabins. 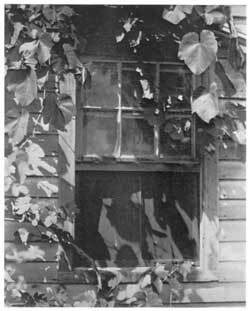 "The moths flitted about the Evening Primroses and the Four-o-clocks; the climbing Rose on the fence bloomed in many white clusters, with a faint odor of musk. The Jasmine near by made the air heavy with fragrance, and many groups of white Speciosum Lilies and white Phlox glimmered in the growing dusk. "It grew late, and I waited for the moon to rise. 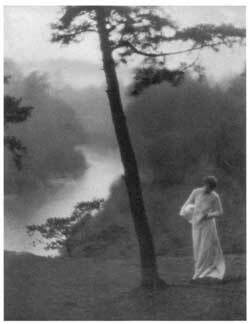 She came at last, sending her white radiance in advance, blanching the thin clouds above her in the eastern sky. It seemed a fire on the mountains at the first glimpse of her. Slowly, she rose, shedding her waning light upon the garden. 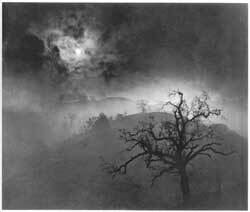 "The night was so beautiful and so calm, that I felt awed. And as I lay in the stillness, I thought of all the old house had known, and of my life there, step by step. 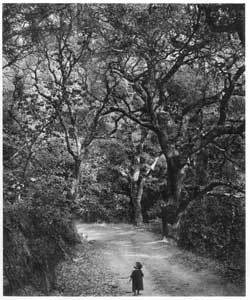 How I had played under the Oaks of the grove, and wandered about the fields with my brother, all the long careless days of childhood. "We invented games for every part of the place, a special one for the back piazza, another for the front verandah, a most exciting one called "Deer and Lion" for the upstairs passage and communicating bedrooms, on rainy days. The rock-brakes in the fields were our kingdoms, and a field of corn a mighty unexplored forest in which we lost our way. "And then they all came back to me, all the dear faces that I had loved, long since, and lost awhile. 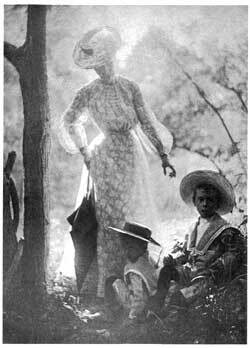 "The garden was peopled with them, my friends of the long ago, they were all there, father mother, sister, and radiant child, and many others, friends, playmates, teachers, They moved about softly, with gentle steps, they filled the circle of vacant chairs by the hammock, left by the guests of the afternoon. "I was not troubled nor afraid: The dim white figures came and went so tranquilly, they smiled at me so tenderly, and all their faces wore a look of pitying love. "It was an exalted dreaming, but it seemed to me that each one had brought me a blessing, and that I received consolation and uplifting from each. "I thought of the broad charity, the warm-hearted generosity, and unsullied honor of one; the beautiful helpfulness and unselfishness of another, the brother's heroic spirit; the sister's nobility; and the joyous innocence of the child. And I besought them to help me to grow every day worthier to be one of them. They nodded gravely and kindly, and then it was as if they joined hands and sang together, words of heavenly promise and benediction. 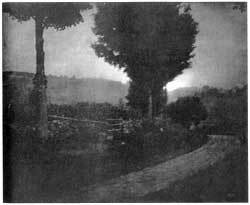 "They faded slowly away, up, up, where the white clouds waited for them, and the pure voices sounded fainter, and fainter and I awakened from my reveries, and went very slowly and softly into the house, and left the old garden to watch, in the moon's company, through the tranquilly summer night. WHAT IS "THE DANSKE MAGIC"? Danske Dandridge's writings take root slowly - on spring's eve. 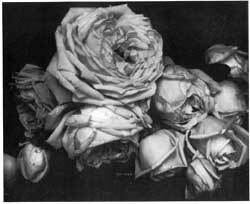 A rose root is to soil as a brilliant word-stroke is to an unlit mind. Only the best, most precious enter Danske's secret garden. A phrase is turned and we wait. 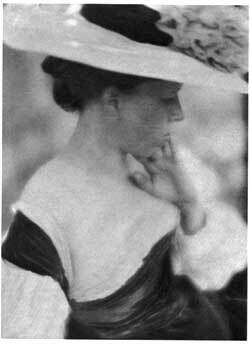 Danske Dandridge was hailed by some as the greatest of poets; by others, a spinster of "dainty," crumpet-poems, one washes down with tea. The blinkered latter lot cart-wheeled over her oceanic, moonlit railings, assuming them lapses - not in their own fumbling grasp - but in her lady-like manners. If she did not meet their expectations, it was because her expectations were much higher. Victorian culture-police gasped when the more primitive Danske bristled at cabin fevers, "like a caged wild animal." Even more insidious was the damage of being mis-filed by the "Harper's" reviewer, squandering praise on this "Dane's excellent second language." 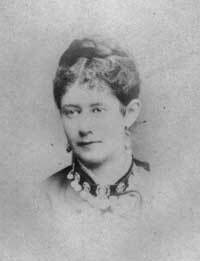 (She was born in Denmark while her Virginian father served as his nation's first ambassador to that country). For me, it began twelve years ago with an article in the local "Good News Paper" by Alexandra Lee Levin, a distant relation of Danske's, who tipped open, for a peek, the heavy, oaken lid on this fairytale world. Then another associate, Dr. Bill Theriault, appealed to my researcher's love for new troves of value, telling me she wrote some 200 gardening articles to add to her three history books I know and use. My pilgrimage to the some 10,000 documents called the "Bedinger-Dandridge Collection" at Duke University's Rare Books and Manuscripts Division tore off the veil and revealed a trembling, brave, extraordinary woman. Her diaries are present, direct, blunt, droll - all pulsing with an aching heart, wishing for a world beyond and all seamless beauties. As I whispered her diary entries into a micro casette recorder, I felt as if this glistening, shadowy world and Universe was beginning to take me into its enchantment. I was becoming a member of the Dandridge family - Totsie, Stevie, Stephen, Serena, with Tom and Charity Devonshire lifting "the heavy end." They all mixed the mundane, ethereal and every day at the stately home called Rose Brake - coping within "moderate means." The enchantress herself, with Tom behind the spade, waved into being a grove of oaks, a garden with over a hundred varieties of roses and over 500 species of tree and plant life until Rose Brake was a kingdom. I've seldom found anyone whose faded, pencil markings can still make me laugh and cry from the remote distance of a century and a day's drive from their homestead. Rose Brake lingers in the mind's eye just above the still-standing, garden-less home, a magical world Danske left for us, to tend its unfading flowers, a secret garden of our own. Thanks to the Shenandoah-Potomac Garden Club, the West Virginia Humanities Council, the Arts and Humanities Alliance of Jefferson County, the West Virginia Division of Culture and History, and the West Virginia Commission on the Arts; the Boarman Arts Center and its director, Patty Perez, for sponsoring these grants; Dr. Linda McCurdy, the director of Duke's Division of Rare Books and Manuscripts; Dr. Bill Theriault; Mr. Leon Washington; Ted Goldsborough, a descendant of Ms. Dandridge; Graphic Designer Shane Brenizer for his unforgettable poster; and Emil Loomis, who looked over Danske's writings with a visually trained eye and master gardener's sensibility. To find out more also check out the web site on her at: www.libraries.wvu.edu/dandridge/index2.htm. 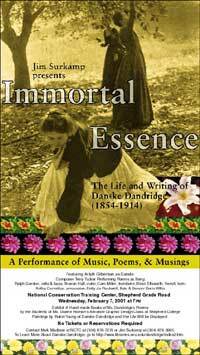 "Immortal Essence: The Life and Writings of Danske Dandridge"
Ardyth Gilbertson: actor. vocalist, Shepherdstown, WV. Ardyth's first perfomances were in 1960, in the country's largest Lutheran Church, Ascension Lutheran Childrens' Choir in Milwaukee, WI. Since then she has sung in numerous choirs, choruses, and productions including "Bells Are Ringing", "Cabaret", "Oliver", "Camelot", Shakespeare's "As You Like It", "Pirates of Penzance" and "Kiss Me Kate". Her favorite part, until Danske, was that of Eliza Dolittle in "My Fair Lady". She has recorded projects with Seth Austin, sung jazz in "The Ardyth Ensemble" with Ralph Gordon, and performs and records with Terry Tucker in "Treehouse". Her love of poetry and the spoken word started on her father's knee, reading Emily Dickinson, Robert Frost and Lord Byron. It continues on as she and husband Jim Surkamp host the monthly "Words & Music" at the Mecklenberg Inn, and at their semi-annual "Folie" performance venues. Terry Tucker: musician/composer, Shepherdstown, WV. She performs original music with her group, "Treehouse." In the 1960s and 70s, she was one of a best-selling trio of women musicians in England called "Sun Forest." She composed a song entitled "Overture to the Sun," that was part of the final soundtrack of the film "A Clockwork Orange" at the request of director Stanley Kubrick. She also composed music for BBC in London on a weekly basis for eight years. 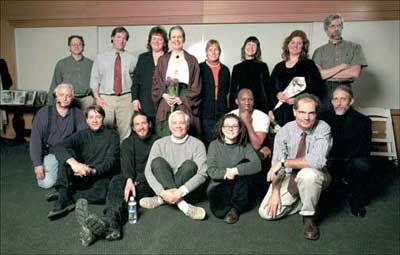 She was the musical director in 1984 of the Children's Radio Theater Project for National Public Radio. She plays keyboards, auto harp, composes, arranges, and sings. She can be reached for professional reasons at 304 876 3552. Seth Austen is a nationally recognized virtuoso acoustic multi-instrumentalist, composing and playing diverse styles from traditional Appalachian and Celtic to bottleneck, eastern European Klezmer and jazz. Seth plays acoustic, resonator and Weissenborn lap steel guitars, mandolin, mandola, mandocello, bouzouki, fiddle, banjo, fretted dulcimer, ukulele, didgeridoo, whistle and frame drums. He has composed music for two documentaries, "To Our Credit: Bootstrap Banking In America and the World," aired on PBS, and "Farmer To Farmer: Strategies For Sustainable Agriculture" (Rodale Institute). Ralph Gordon: instrumentalist contrabass, violoncello, Kabletown, WV. Ralph is a classically trained musician educated at West Virginia University and the Manhattan School of Music. He spent eight years with the group Trapezoid ™, contributing to the band's innovative acoustic sound described by the New York Times as "... a delightful melange." He displays skill and technique in many styles of music including Scottish, English country, contradance, hoedown, folk, bluegrass, klezmer, blues, swing , jazz combos, and big bands. He has the versatility to move from playing in chamber settings with hammered dulcimers to driving with a big band. As Jack Dressler of the "Charleston Post Courier" said of his playing with Trapezoid, "His playing is more sophisticated and technically accomplished than the next ten string players of any sort and he uses his instruments to subtly ground, stabilize, and inspire the rest of the ensemble as they pursue their experimentations." In addition to being an instructor or on staff at many dance and music weeks , Ralph is in much demand in the Washington/ Baltimore metropolitan areas as a freelance artist and a session musician. He can be heard on more than sixty recordings. On many of these he has demonstrated his skills in arranging and producing as well making his unique musical contribution. 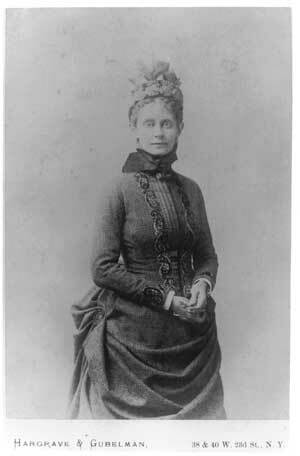 She was born the third child of Henry and Caroline Bedinger in November, 1854 in Copenhagen, while her father served as this country's first ambassador to Denmark. 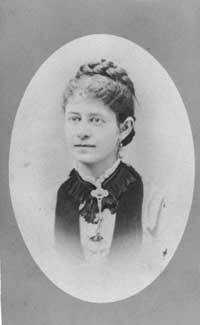 Her father died in November, 1858, just two weeks after returning to Shepherdstown. VA. (today in easternmost West Virginia). He had come down with pneumonia while speaking to a cheering crowd before a bonfire in front of the Entler Hotel. 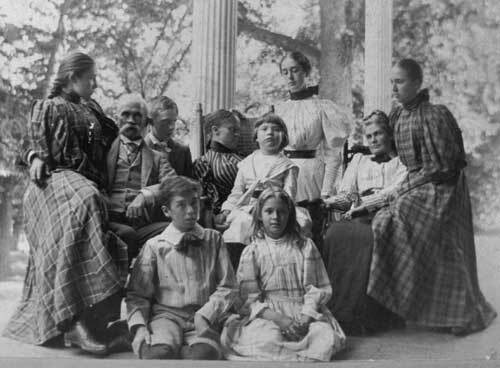 The family lived a while at "Bedford" with her father's sister, Henrietta Bedinger Lee, and her husband, Edmund Jennings Lee, the first cousin of Robert E. Lee. 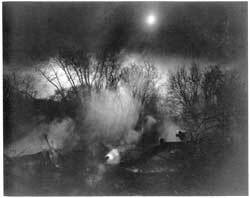 (Bedford was burned by Union troops in July, 1864). 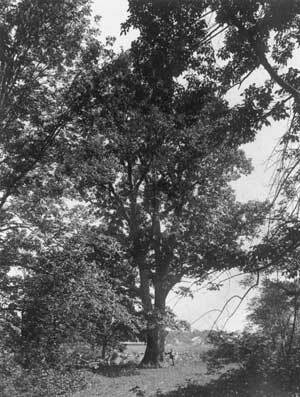 Danske's frail mother soon bought Poplar Grove and fifty acres from the Morgan family. During the battle of Antietam, Danske, her mother, brother, and sister cared for wounded men in their house. Her sister, Mary Bedinger Mitchell, would write a famous essay called "A Women's Recollections of Antietam" which appears in Vol. II of "Battles and Leaders," a widely used Civil War reference. 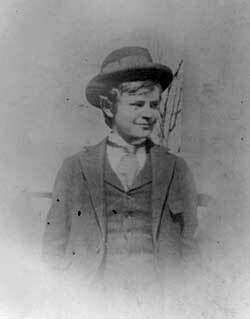 Her step-brother, George Bedinger Rust was killed at Gettysburg. Danske's mother opposed slavery and hired all help. When her mother, too, died in 1869. Danske, her writing gifts astir, went to live with her wealthy and prominent grandparents in Flushing, NY. 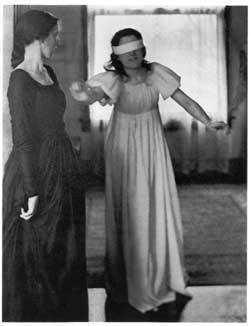 She had been attending Mrs. Pelham's Priory in Staunton, Virginia, where she experienced a religious awakening. 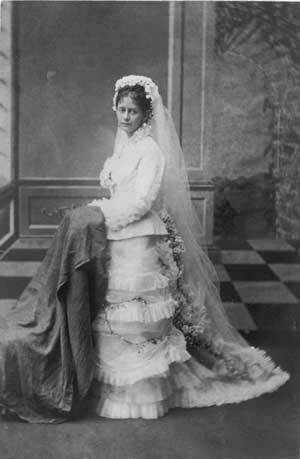 She married Adam Stephen Dandridge in 1877, a handsome son of the venerable Dandridge family that lived at "The Bower," in Jefferson County. The Bower was the inspiration for an influential southern novel called "Swallow Barn" by John Pendleton Kennedy. The Dandridge's Bower also fed and entertained about 300 of J.E.B. Stuart's cavalry men for almost a month in September-October, 1862. After what she called "Ten Perfect Years" in which she gave birth to her first two children, Serena and Stevie, Danske turned, at a friend's urging, to write in earnest. 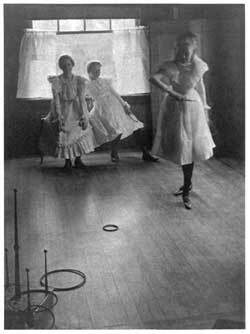 A difference in temperment between the intense, otherworldy Danske and her genial, uncomplicated husband led them to pursue divergent interests; she her poems , her garden, and a wide range of "postal friends"; he, spending time playing Muggins (a game of dominoes) at the A. S. Dandridge Farm Implements Shop. 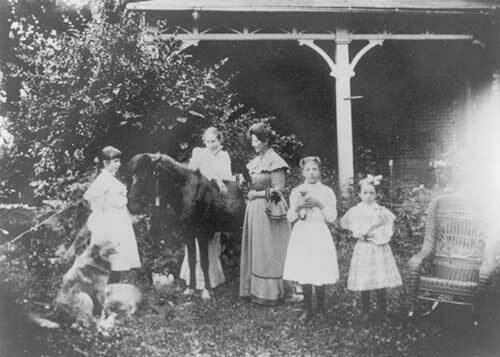 Danske, a poet of delicate constitution, wrote of her struggle to make ends meet at their home, (which she owned and had inherited), while her husband was relatively unproductive. Danske would go away for stretches to sanitariums, paid for by her wealthy family. Stephen would serve in the West Virginia House of Delegates, spending in-session months in far away Charleston. 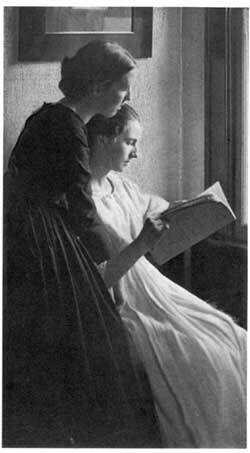 Danske published two volumes of poetry in the late 19th century: "Rose Brake," (the new name she gave her home), and "Joy and Other Poems." They were widely acclaimed. 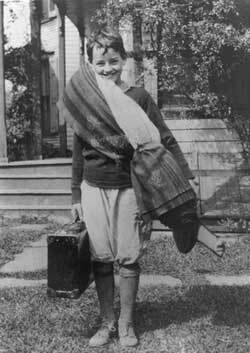 Had she lived in a large city closer to publishers and reviewers, she would have probably had yet greater reknown. Poet John Greenleaf Whittier included her poem, "The Struggle," in his anthology of great poetry covering a 400-year period. 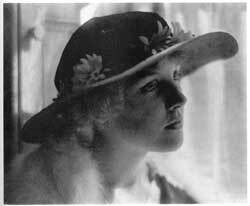 She also wrote an estimated 200 gardening articles or letters to magazines, such as "Garden and Forest." She created, with the help of her African-American gardeners Tom and Charity Devonshire, a fabulous garden with a hundred varieties of roses along with innumerable other types of plant life. She also wrote four books: "Historic Shepherdstown," "George Michael Bedinger: Kentucky Pioneer", "American Prisoners of the Revolution," and an unpublished manuscript about General St. Clair. Her progression away from poems, to garden articles; and finally the dryer, more dispassionate study of history, mirrors the timing of the deaths of two of her children, 16-year-old Stevie and 12-year-old Dorothea, or "Dotise." Their losses seem to chart her gradual withdrawal from any writing that is emotionally intense and vulnerable. Danske died June 3, 1914 with no will. Some of the town's waggier tongues punished Danske for her aloof unconventionality calling her "crazy", the price for eschewing her quota of church picnics. When a gun went off in her house the day she died with only Danske and an Irish nurse in the house, the same tongues called it a suicide. Helen Goldsborough, a relative who lived across the street at "Leeland," wrote that this is a claim Danske's family and persons who lived their entire lives at Rose Brake have always denied. Danske's death, Miss Goldsborough and other close family friends say, involved the disgruntled nurse the ailing Danske had fired just days before. The nurse had refused to leave. 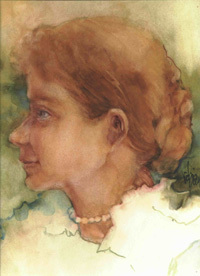 Husband Stephen died about a decade later, leaving their artistic daughter Serena, also called "Miss Violet," to live out her life at Rose Brake. 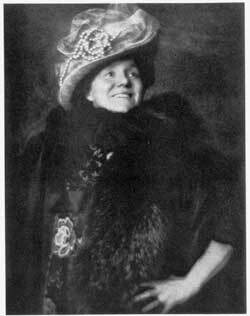 Her cousin, Nina Mitchell, daughter of Danske's sister, Mary, came to live at Rose Brake around the time of World War I. She and Miss Violet, who later asked to be called "Serena K." in memory of an aunt she loved, became two of the most beloved and generous residents Shepherdstown has ever had. Longtime residents have often said "Miss Violet and Miss Nina" are the very essence, and something of a source, of what is Shepherdstown, in style and outlook. A friend said lovingly that almost everyone in this remarkable family was very religious, goodhearted, and greatly talented in the arts. Yet most also had a "slightly loose screw" to spice the memory of them. The friend said that this "crack" in the family's members was like one the Grecian goddess Diana decreed as "the place were the demons were shown out".